Bon Scrapatit Designs: HAPPY (inter) NSD Y'ALL - LOTS OF GOODIES OUT AND ABOUT!!! HAPPY (inter) NSD Y'ALL - LOTS OF GOODIES OUT AND ABOUT!!! I am slipping in QUICKLY but NOT quietly to wish you all a VERY lovely day as you scurry about SCRAPLAND gathering DELICIOUS goodies from here and there and just about EVERYWHERE!!! I need to sneak out and look around at some of the sales myself, starting at One Single Seed, where I am hanging my designer wings shortly (I'm there, but my store is bare!) and everything is 40% off until midnight tonight!!! WOO HOO! LIFE seems to get in the way, but I expect it and I just KNOW y'all understand it as well, so I am dropping in to give you a bit of a SNEAK-PEEK as to what I have for you as a result of Kim B's April Colour Challenge and (inter) National Scrapbooking Day! 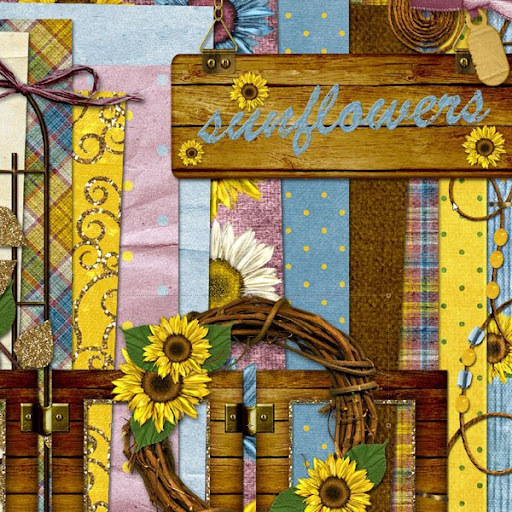 I hope y'all will like it, especially those loving sunflowers!!! For a QUICK story on sunflowers in THIS girl's life ... long, long ago in another time, I just about VOWED that I'd NEVER have sunflowers decorating my home, even as POPULAR as they were back in the early to mid-90's. WHY? Well, because I was at the height of my NEWLY found passion of crafting and had redone my home decor to reflect the, then, rather trendy country flavor boasting mauves, pinks and blues! Blue being my VERY favorite color made it rather easy for me to be accepting of the "pinks", which I was not ALL that fond of, but quickly began to like! My ex-husband and I were just about to move up here to Copperopolis from the valley where I had already begun the artful country living! LOL! Okay, long-story short, the place I was selling my homecrafted items at had this LOVLEY oak-framed print of cows and sunflowers that just HAPPENED (meant-to-be) to have a dual matte of, would you believe, PINK AND BLUE!!! OMGosh ... I had pined over that picture for several months and was finally able to purchase it just a short time before our move. I had also found the SWEETEST kitchen towels, oven mitts and such that sported the same theme with a green base! I won't tell you how far I went with the sunflowers, but my kitchen was FULL of them!!! I even had sunflower vines strung across the tops of our cabinets intertwined with white lights!!! Somewhere, I believe I have a few photos. That was my FAVORITE kitchen EVER as it was SO open and just perfect for our large family. MICHELE - thank you for sharing your story! I surely have learned over the years as I've become a wee bit wiser to NEVER say NEVER! ROFL! I am SO sorry to leave y'all hanging as to what my Mother's Day gift is, but I was waiting for it's arrival and had NO idea that it would show up the VERY next day (yesterday!) and a week ahead of what I expected!!! I just ADORE Robert anyhow, but I can't help but feel like a princess when he agrees with my needs! And THIS was DEFINITELY a need as I've been working on a 17-inch monitor for the longest time and these almost 55-year-old eyeballs REALLY needed some relief! I am also in need of moving myself from our bedroom, which used to be my computer room, into another room so that I am not scrunched up into a corner with no room to move! Now that we are down to one adult child, we have some extra room to revamp and Robert is wishing to buy me a new desk as well. He has an L-shaped set-up at work and that is what I used to have before giving up my computer room, so he understands how it helps one to work a little more efficiently. BETH W - I shall be hoping and praying that you receive your desire of a scanner! It is once piece of equipment that earns it's price rather quickly I believe. I have scanned all kinds of things that I've known I'd probably NEVER see again. Just a few weeks ago, Mark asked if I had his birth certificate and I made a copy of it in the event that I don't get it back, which I am not expecting to!!! I wish I had thought of that before giving the girl's their copies!!! Oh well, one day when I can afford it, I'll send for copies for those I no longer have so that I can put them into each album when I get them made! I DO, actually, have a bit of an L-shaped set-up where I am, however, the "L" is my bed and where I find myself placing my notebooks and whatever else I am using while creating!!! LOL! Below is a bit of a SNEAK-PEEK of *Girasole* and I should be back before my night is over to bring you the first part. If you are still attending chats, crops or shopping, HAVE FUN!!! I've also posted a preview of my BFF's NSD goodie for y'all and have attached a direct link to the image so you can snag it if you haven't already! 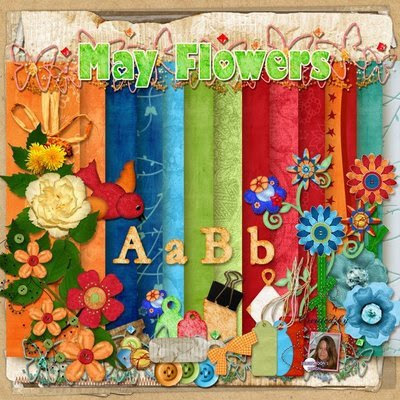 LOVE those BRIGHT, CHEERFUL colors in Dawn's *May Flowers*!!! Catch you on the FLIP-SIDE!!! P.S. SHARON - I am SO happy to see your face!!! I was just starting to wonder where you were. With my being away and not having Internet, I had not noticed your absence right away. I am glad that you are on the mend and able to spend time with your DARLING granddaughter! BIG HUGS to you! Click the image above to be transported to Dawn's blog! Leave her some LOVIN' for me! MWAH!